In his book ‘Super Intelligence: Paths, Dangers, Strategies’ (A new York Times Bestseller), Nick Bostrom, Professor of Philosophy at the University of Oxford and Director of the Future of Humanity Institute, argues that the creation of artificial intelligence with human-level intelligence as defined by ‘singularity’ will be followed fairly soon by the existence of an almost omnipotent Superintelligence, with consequences that may well be disastrous for humanity. Bill Gates and Elon Musk along with other hi-profile individuals have raised similar concerns and suggest that AI safety needs to be addressed on a large scale. Responding to their efforts The Future of Humanity Institute and Nick Bostrom have been awarded a prestigious grant from the European Research Council to develop a framework for the discussion on ethical decisions involving catastrophic events as possibly caused by Superintelligence. Catastrophic events caused by the application of artificial intelligence can happen today. The VW diesel emissions disaster will be go down in history as one of the most significant commercial disasters with billions of dollars lost in the value of share capital and damage to VW’s reputation which will be extremely costly and time-consuming to repair. The combustion process in today’s automotive engines is largely managed by software and computer hardware. Sensors which supervise the driving conditions like temperature, speed, acceleration, fuel consumption etc. provide input to the device that controls the fuel/air ratio before combustion takes place. This again impacts exhaust emissions such as CO2 or fine dust particles. Combined with all the other car control features like GPS and various assistance systems, today’s cars are equipped with a highly complex software that permanently records the handling of the car and its associated emission profile. At some point – and this is now being investigated – engineers at Volkswagen had the idea that a sophisticated software algorithm could be implemented that would sense if the car was being tested for exhaust emission and regulate the combustion process to ensure that government requirements were being met. Under normal driving conditions, however, this ‘artificial intelligence switch’ would not be activated causing far higher emissions. To design and implement this ‘switch’ is fraud by any legal standard. Capital intensive research efforts to manufacture new engines were circumvented in favor of a low-cost artificial intelligence software solution. Beyond the financial damage caused by this action, the violation of trust as experienced by the average consumer is shocking. Who gave the sign-off at VW to implement the ‘switch’? Most likely people high up in the hierarchy of the corporation must have known. Additional laws will be put into place to avoid a reoccurrence of the VW case. However, unless a corporate culture of ethical conduct is implemented, also applied to the design of AI software, laws will be broken again. To build-up such a corporate culture takes time and it has to start at the top. Corporate leaders have to set an example. A high level of emotional intelligence is required to provide credibility in ethical conduct. We cannot lean back and leave it to governmental organizations to settle ethical issues. 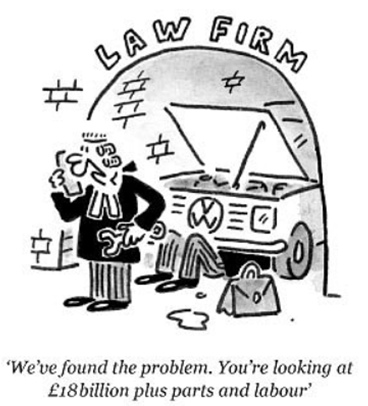 Implementing the fraudulent ‘switch’ by VW is shocking, however as shocking is the fact the European Commission was informed as early as 2010 about irregularities in the diesel exhaust of certain VW cars. Measurements carried out by the Joint Research Council (JRC) which started as early as 2007 showed discrepancies between the emissions at the time of formal car inspections (Typenzulassung) and the emissions measured during normal driving conditions. The JRC concluded that the application of certain ‘Minderungstechnologien’ was widespread. According to investigations carried out by the News Magazine ‘Spiegel Online’ internal documents show that German Government authorities was participating in meetings with the European Commission as early as 2012 to discuss the application of the ‘switch’, long before the scandal reached world-wide attention in 2015. Governmental bureaucracy combined with lobbying by some members the automobile industry had delayed action against this fraud. The development of artificial intelligence software is a very complex task. A few highly talented individuals can have an enormous impact as the VW disaster shows. Motivated by Nick Bostrom’s book people like Ernest Davis, Professor of Computer Science at NYU in a recent publication suggests that ethical programming standards can be established. As an example he proposes a ‘switch’ that shuts down the computer if certain predefined ethical rules are violated. How this can be implemented requires further research.